Who’s the fiercest of them all? Christian Siriano is taking advantage of the momentum after his win as 2008 Season 4 Project Runway’s top designer, landing endorsements and signing joint ventures while his ticket is hot. You gotta give it up to PR’s Golden Child, he is working his fingers to the bone to remain in the public eye. I will say this… his product lines are meant for the average person’s income, a fact I greatly appreciate. 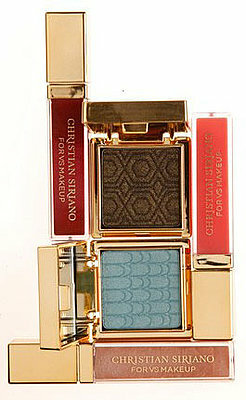 First, there’s his makeup line, “Christian Siriano for Victoria’s Secret.” Yup, makeup. But makeup walks the runway, so high five on getting Heidi Klum to put in a good word. It’s all about who you know, right? Due out in August, the line will feature five shades of eye shadow ($14 each); three lip gloss shades ($14 each); black eyeliner ($12); a bronzer-highlighter trio ($24); a face brush ($32); and a ruffled cosmetics bag ($16). And then there’s that Tori Spelling thing… watchers of Tori & Dean’s reality TV show recently saw Tori and Christian gushing over their love for each other while working the red carpet. Christian said he wants to use Tori’s HSN jewelry for his runway show (or is it “shows,” as in plural?) I say they’re made for each other, it takes a media hound to know a media hound. Grab that celebrity train! No official word yet on when these two might complete their fashion hookup.